Pay-per-click (PPC) advertising is one of the fastest ways to increase page views and drive traffic to your website. When brands want the number of visitors on their website to skyrocket ASAP, PPC advertisements are one of the most common solutions. Though the process may appear simple at first glance, PPC ads require lots of pre-planning, research, and careful monitoring to truly be successful. Without understanding the process, you can end up burning through money and seeing little to no return on your efforts. Before launching a campaign of your own, make sure you’re prepared with these PPC advertising tips. PPC advertising is a form of internet marketing used by brands to increase traffic to their website. Brands determine a total budget they are willing to spend and then pay a fee to the host site each time someone clicks on the sponsored ad. Browsers display PPC ads above the organic results on the results page. For example, they are located at the top or right-hand side of a Google results page and have the word “ad” written beneath their link. To make sure you get the best results and maximize your ROI, keep these helpful tips in mind. Google AdWords is the most popular advertising service for brands who wish to display ads on the mega search engine. In Google AdWords, companies bid on keywords they want to use in their campaigns, and Google then selects a “winner” based on a variety of factors. To see more about how Google auctions keywords, see this infographic. Determining which keyword(s) you want to focus on during your campaign is crucial to the success of your advertisement. A common mistake brands make in their PPC advertising plans is failing to research their desired keywords. Prematurely selecting a keyword can cost you loads of money and leave you with little to show for it. Specific words or phrases that directly relate to your advertised product, service, or website. Relevancy is key, and well-research, targeted keywords lead to more relevant web traffic, higher click-through-rates, and hopefully, result in more conversions once users visit your landing page. Long tail keywords. Instead of choosing a broad keyword, use “long tail” keywords to zero in on what you’re promoting. For example, if you’re advertising smartphone repairs, instead of choosing “smartphone repairs” as your keyword, consider choosing “iPhone 7 screen repairs” instead. Long tail keywords are often less expensive to bid on because of the lower demand and competition for them, which in turn will help you save money and focus on your specific desired audience. Are your keywords performing well? Make sure you’re getting your money’s worth on the keywords you initially selected. Check to see if they are producing results, and pull the plug on any keywords that aren’t performing up-to-par. Can you add negative keywords? Adding to your list of negative keywords will help increase relevancy and ensure you’re only paying for clicks that match your campaign audience and goal. For example, if you’re advertising paint brushes and bid on the keyword “brushes,” you may pay for a host of clicks by users searching for hair brushes, tooth brushes, makeup brushes, etc. These people aren’t interested in your product, but their clicks will still cost you. In this case, you would add “hair,” “tooth,” and “makeup” to your list of negative keywords. Is your landing page optimized for your advertised CTA (call to action)? Make sure to optimize the page you’re directing people to for conversion rates. Once users click on your ad, the “next step” should be obvious to visitors. Directing users to the most appropriate landing page can’t always guarantee a sale or lead, but it’s the next best thing you can do as a brand. 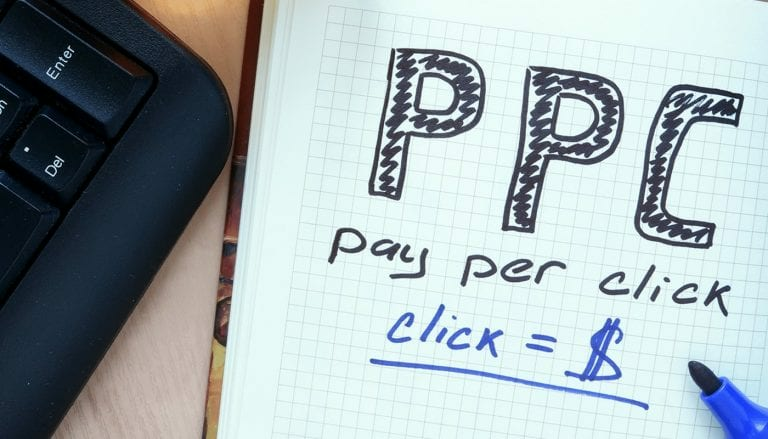 Though companies are always striving to gain website traffic organically, sometimes enlisting the help of PPC advertising is necessary. If you need assistance with developing a new online marketing strategy, contact Front Porch Solutions. We’ll design a plan with your unique needs and budget in mind to ensure you get the best results, whatever they may be.